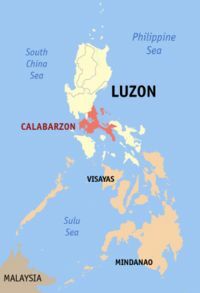 CALABARZON is one of the regions of the Philippines and is also designated as Region IV-A and its regional capital is Calamba City in Laguna. The region is composed of five provinces, namely: Cavite, Laguna, Batangas, Rizal, and Quezon. The region's name is an acronym of the names of these provinces. CALABARZON and MIMAROPA were previously combined together as Southern Tagalog, until they were separated in 2002. Palawan was almost moved from MIMAROPA to the more logical Western Visayas, but the proposition was never pushed thru. Executive Order No. 246, dated October 28, 2003, designated Calamba City as the regional center of CALABARZON.